with a rather disconcerted guy eying the sign. 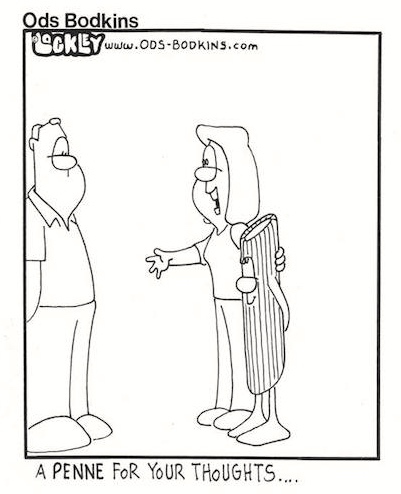 (I haven’t been able to find a copy of the cartoon, although I’ve found tons of other one-panel gag cartoons by Lockley, many of them playing with language (Ods Bodkins homepage here, very useful Ods Bodkins Facebook page here). I’ll post six of these below, but for the Batman cartoon — Batman definitely is a cartoon meme these days, by the way — I’ll have to rely on describing it. First thing to note is that bat guano (Holy Batshit, Robin!) is a precious commodity, mined as a source of really excellent fertilizer; you can buy it on-line. What’s disconcerting in the cartoon is that guano is being offered for sale not by a bat, but by Batman (a superhero, yes, but very much a man and not a bat), so presumably the guano on offer isn’t batshit but manshit, a substance that can, when properly processed, be used as fertilizer, but which is off-putting in its raw form. So the strip is scatological humor with a bit of language play folded in. On to other Lockley cartoons, presented here in essentially random order. 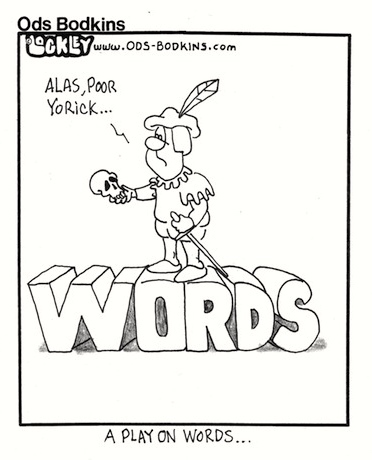 Ambiguity of play, ambiguity of on, use-mention ambiguity with words (used in the idiom play on words, mentioned in the cartoon). The formula is now “The love of money is the root of all evil”, a version of the sentiment in 1 Timothy 6:10 (which, of course, has been translated in a number of ways). 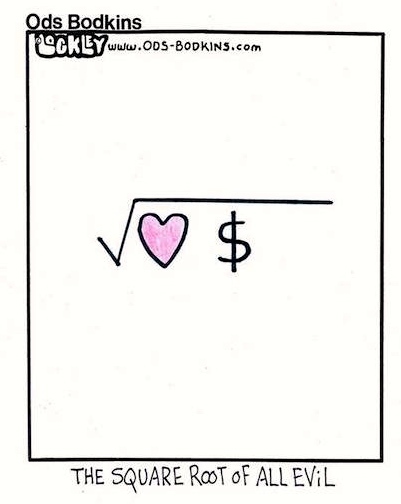 Lockley has converted the root to the square root (a play on the ambiguity of root) and then reproduced this in graphic form, with the square root sign and the symbolic ♥︎﹩ (‘heart dollar’ for ‘love money’). Yes, I know, the graphic seems to be representing the square root of loving money. Glazed ham has the verb glaze ‘overlay or cover (food, fabric, etc.) 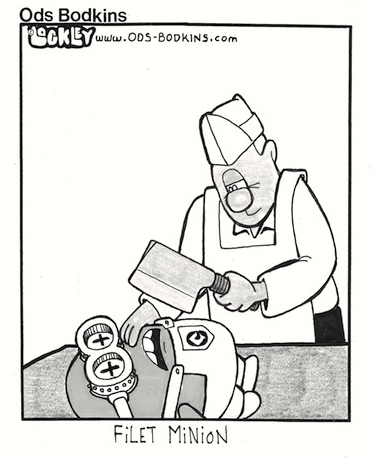 with a smooth, shiny coating or finish’ (NOAD2), and the tv viewer in the cartoon is a pig, the animal that supplies the cured meat ham. 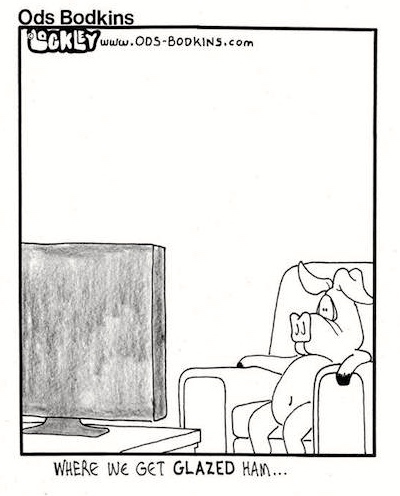 And that pig’s eyes have glazed over from watching tv (presumably, very boring tv), with a different verb glaze ‘lose brightness and animation’ (NOAD2 again). A lot of stuff packed into this one. In the idiom a penny for your thoughts, used to ask someone what they’re thinking about. 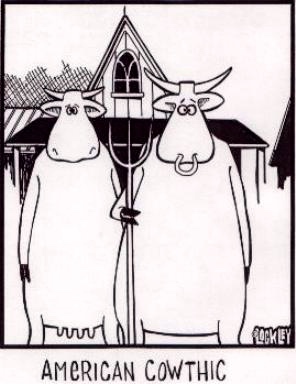 It’s crucial that you recognize Grant Wood’s famous (and much parodied) painting American Gothic — shown here in a bovine version. Otherwise, cow and Goth are very distant phonetically. This entry was posted on January 21, 2016 at 6:19 am and is filed under Language play, Linguistics in the comics, Movies and tv. You can follow any responses to this entry through the RSS 2.0 feed. You can leave a response, or trackback from your own site.